Stack dice on your forehead, bounce dice into the box, knock down a meeple surrounded by dice, balance a meeple on a stick. 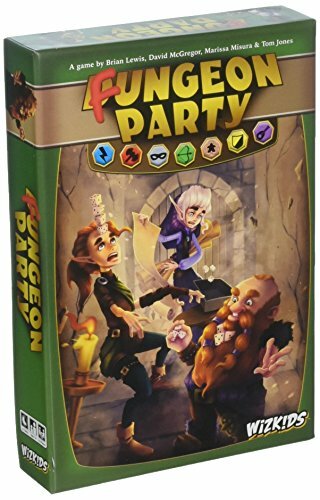 These, and many more wacky quests await a traditional dungeon party in this truly untraditional dungeon crawler. Each quest adds 30 seconds to the game and an average game uses 6 quests making this a quick, easy, and FUN game to learn and play! We put the fun in Fungeon! COMPONENTS: 66 Challenge Cards, 7 Role Cards, 40 Dice, 1 Meeple, 6 Sticks, Rule Book. If you have any questions about this product by Board Games WizKids, contact us by completing and submitting the form below. If you are looking for a specif part number, please include it with your message.